As society has advanced, we have become incredibly technological, and our awareness and interaction revolves around the many social media platforms that we use. These changes have led advertisers to modify the way in which they get their message out to the public, as they have had to learn to engage us in new ways that incorporate our advancing social media. Many brands and organizations have adopted methods of advertising that they most likely would not have in the past, which has actually opened many new doors in terms of spreading messages and ideas. Through this campaign, the WWF set out to raise awareness for the many endangered species that are rapidly disappearing from our world. They needed to properly reach the target audience, which was primarily Millennials, in order to inform, and concern, them of the population decline of these species of animals. The overall goal of the campaign was to raise awareness surrounding endangered species, as well as the WWF as a whole, and consequently encourage more donations, which would go towards the protection of the advertised species. The World Wildlife Fund went about meeting their objectives by finding a way to reach a very large audience in a way that would stick in their minds, and ultimately raise awareness for the cause. They were primarily targeting Millennials, who are particularly active in the social media world. Snapchat has rapidly grown in popularity, and the majority of Millennials currently use it, which was one of the reasons why it was strategically chosen as the social media platform for this campaign. Snapchat also worked very well with the WWF’s mission and objectives, as the short duration of time that you can see a Snapchat represents the shortening lives of the animals that belong to endangered species throughout the world. In creating the campaign, the WWF emphasized the connection between the shared images on Snapchat and moments in the real world. In doing so, they drew on the idea that Snapchats and the lives of the animals that they work to protect and conserve are very similar, in that they are short and will disappear if we don’t take action, or screenshot and share, very soon. 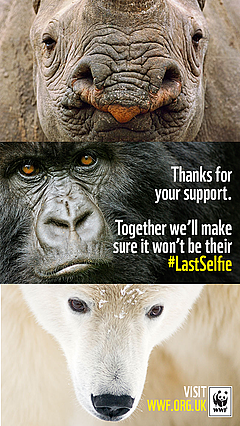 They decided to illustrate this connection with the idea of the animals’ “#LastSelfie.” This strategy was designed to draw in Snapchat users, and thus Millennials, by humanizing endangered species in a way that they can relate to and understand: through Snapchat and selfies. Given that these are concepts that Snapchat users are very familiar with, the WWF hoped that this strategy would provoke and increase understanding and responsiveness surrounding the preservation of wildlife. In terms of Snapchat users taking action, there was a message on each advertisement, which indicated a number to text for information on the organization and cause. The World Wildlife Fund’s campaign was one of the earlier Snapchat campaigns, as the element of advertising is still relatively new to Snapchat. It was a very fresh and different advertising technique than the organization, as well as many like it, had ever used, and thus, there is a lot to learn from the campaign. The idea behind the campaign was very well planned, as Snapchat was the perfect platform for targeting the intended audience, and it was a great way to get that audience’s attention. Much of the generation is very passionate about social media, and particularly Snapchat, so the campaign was very well placed. Additionally, the way in which the WWF connected Snapchat and selfies to the disappearance of animal species was very well thought out as well. Giving the cause that they were advertising meaning within social media is a very unique and interesting strategy, which tied a serious message to popular culture, by incorporating what was currently prevalent within social media. The time limit of Snapchat is another aspect of the campaign that benefitted its overall success. It created a need to take action, as the image would soon disappear, so in order to see it again, Snapchat users needed to screenshot it and share it through other social media outlets. This makes it a part of their photos, and something that they will potentially look at again or share with others, and then, hopefully, decide to donate. Initially, this campaign seemed very innovative, but also a bit experimental, as it was not something that had been done previously. It quickly exceeded all initial expectations, as the WWF received donations sufficient for one month within the first three days of the campaign. Additionally, there was a great amount of sharing being done on other social media platforms, such as Twitter and Facebook. The overall success of this campaign comes from the fact that the WWF was able to meet consumers where they naturally interact: on social media, and more specifically, Snapchat. They successfully created a campaign that not only informed and concerned them, but also encouraged them to connect to the cause on a deeper level, and ultimately, donate to help preserve the endangered species. There is a lot to be learned from this campaign as a whole, specifically in terms of how to successfully advertise to a very social media-oriented generation.